In 1974, a 29-year-old local news reporter in Sarasota, Florida, went on a WXLT-TV news broadcast and told viewers, "In keeping with Channel 40's policy of bringing you the latest in 'blood and guts', and in living color, you are going to see another first -- attempted suicide." Then she pulled a revolver out of her bag and fatally shot herself in the head. The horrific act may seem both peculiar and distant. 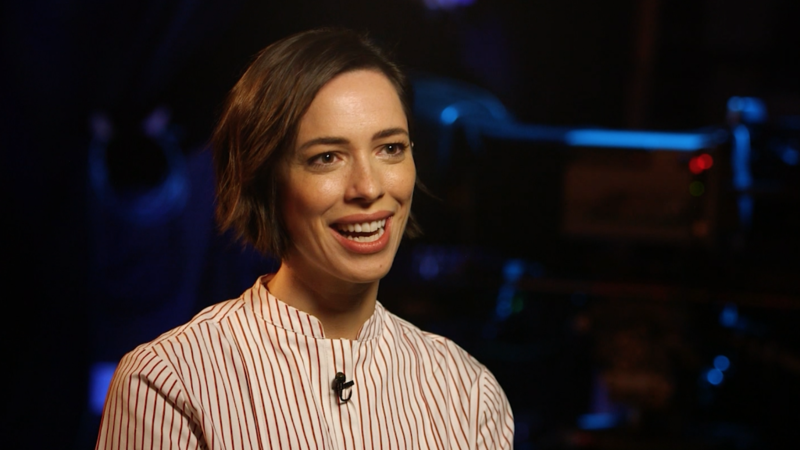 But Rebecca Hall, who plays the role of Christine Chubbuck in the new film "Christine," which debuts in theaters on Friday, says Chubbuck's story is as relevant as ever. "I don't look at this as historical. It feels vital," Hall told CNNMoney in a recent interview. Hall described Chubbuck as "a harbinger of some of the things that we as a society, still today, have a hard time talking about," from depression and mental health issues to the expectations of women in the workplace, and women in positions of authority. But there is also the issue of media sensationalism -- the "blood and guts." Broadcast journalism at the time of Chubbuck's death "was the moment when news reporting was shifting toward sensationalism... and this notion of using fear to generate add revenue," Hall said. "There's a through line from then to now to the click-bait mentality and everything we see." "The notion of news as spectacle is very timely," Hall said. When "Christine" begins, Chubbuck is eager to pursue high-impact stories about important issues affecting the community. But there is increasing pressure at her station, and therefore on Chubbuck, to produce "juicier" stories about violence and crime. Meanwhile, Chubbuck is wrestling with her own demons: her depression, her inability to make emotional connections, her unfulfilled career ambitions and her romantic desire for a colleague, which she seems incapable of acting upon. Together, these pressures bring Chubbuck to a point where she accepts the suicidal instinct she has fought throughout the entire film. If you haven't seen the film, it may sound like a painful tragedy that revels in darkness. According to Hall, it is just the opposite. The film "is not about the act," she said, but rather about Chubbuck's tenacity in the face of her depression and personal setbacks. "One of its most admirable qualities of this film is that it doesn't revel in darkness. In fact, it's driven by a fundamental empathy for a woman trying to live." "Anyone who commits an act of violence to themselves or others is worth consideration in the sense that there must be something that brought them to that point, whether it's a mental health issue or otherwise," Hall said. "That feels the work of the movie, to explore this with compassion." "Christine" is a compassionate film. It is a poignant film. And, like Chubbuck's own story, it is both peculiar and vital. It achieves insight without dogma, which is a rare feat. "This film's a unicorn. I have no other way to best describe it and it was a unicorn on the page," Hall said. "It's truly an original piece of art."